“Beyond global warming there are 53,000 deaths per year from auto emissions,” Musk added. Tonight, Musk released the first official details on the company’s most important car to date, the Tesla Model 3. The base version of the all-electric vehicle will have a range of 215 miles, a continuous pane of glass on the rear roof, and front and rear trunks. Musk added that the car could comfortably fit a 7ft surfboard. 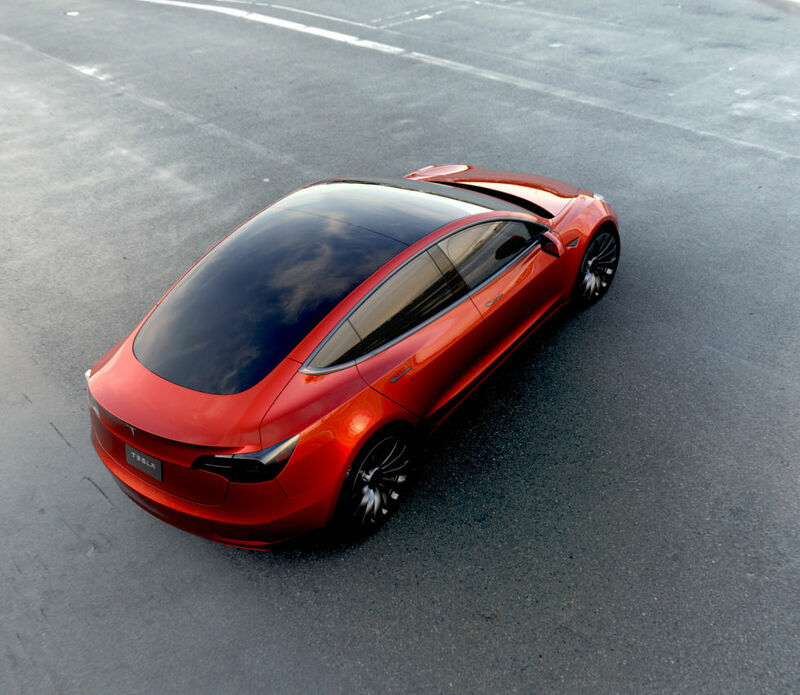 The glass roof is similar to the one on the Model X, made with layers of glass to absorb and reflect UV light, keeping the car from getting too hot in the summer sun. “This can fit five adults comfortably,” Musk said, noting that the Model 3 would have a compressed instrument panel, pushing the front seats slightly forward compared to a traditional gasoline car. Musk also said that all Model 3s would come with supercharging standard, and he projected that Tesla would double the number of Superchargers around the world by the end of 2017. In addition, the base version of the Model 3 will come with autopilot hardware, Musk said, as well as safety features that would keep the car among the top-ranking vehicles with US safety regulators. The car will be Tesla’s first mass-market vehicle, with a baseline price tag of just $35,000 (before any tax credits or incentives), compared to the more expensive Model S and Model X, which retail from $75,000 and $80,000, respectively. The Model 3 is essentially a pared-down version of the Model S, which debuted in 2012. 200-mile range, sub-$30,000 price tag, and production begins this year. Tesla didn’t give a weight for the car, but Tesla’s vice president of engineering, Doug Field, said that the body of the car will be lighter than the Model S, using a mixture of aluminum and steel for the frame. Musk has long maintained that his goal is to make electric vehicles accessible to everyone—not just the few who can afford to drop a year’s salary on a car. But besides being an environmentally conscious motive, it’s a business imperative, too. Tesla has struggled with profitability, posting losses for 11 straight quarters as the company fought to meet its deadline for the Model X (which was announced in September 2015) and then strived to fulfill demand for the high-end electric SUV in subsequent months. On an earnings call in February, Tesla said it expected to end up back in the black again sometime this quarter. Customers were able to place reservations for the Model 3 with a $1,000 deposit starting Thursday morning at Tesla stores around the country and online starting at 7:30pm PT this evening. The car is not expected to go into production until 2017, and some analysts point to the delays of the Model X as evidence that 2017 might be too early to expect the Model 3.